SouthJan is a family-owned commercial cleaning services based in the Columbia, SC area. We are not a franchise, and we are not owned by an out-of-town corporation. We live where we do business—right here in the beautiful Midlands region of South Carolina. We use highest technological help for cleaning methods, chemicals, and equipment to facilitate and expedite the cleaning process. SouthJan mainly focuses on Commercial Cleaning Services for Corporate Offices, Industries, Medical Facilities. Whether it is keeping a busy lobby’s carpet clean or disinfecting an operating room’s surfaces, a janitorial cleaning company is responsible for one primary task: making the environment safe and healthy for the people who work in and visit it every day. We achieve that goal for our valued clients by hiring excellent team members, training them extensively in cleaning techniques (including PPE and OSHA topics), educating them on security and privacy issues, and putting today’s best cleaning tools in their hands. We take seriously the public, high-traffic areas of your facility. 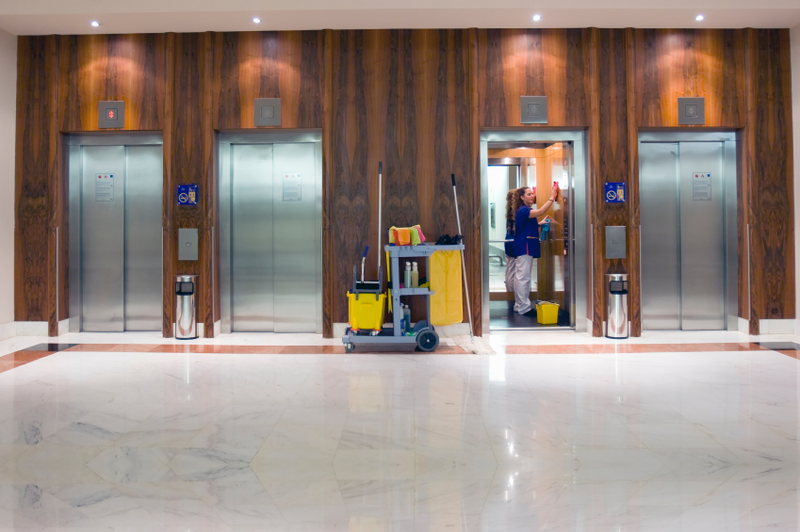 Our janitorial cleaning company takes on the responsibility of making your restrooms, lobby, and waiting rooms what they should be: an impressive introduction to your company’s high quality of service. Specialized areas, such as industrial buildings cleaning and hospitals cleaning services, require specialized janitorial cleaning services. The associates we send to perform these services are fully trained and fully equipped to accomplish the task at hand quickly and properly. If your facility is operational 24 hours a day, it can be tough to schedule cleaning. Our day porter service is the perfect solution—simply tell us when you need our janitorial cleaning company on site. For maintenance outside of business hours, our associates offer on-time, complete cleaning that matches your building’s schedule. Why SouthJan is the Best Commercial Cleaning Company in Columbia SC? We stay informed about the latest research on cleaning techniques and products, improving our service on a constant basis. Background checks and screenings are just the beginning—our associates undergo extensive training in cleaning techniques and safety/security protocols. From carpets to hard flooring, we perform steam cleaning, spot cleaning, waxing, buffing, and all other floor cleaning tasks. We go beyond the basics, keeping your building free of cobwebs, dust, and other contaminants. Prioritize your patients’ health and safety by choosing our highly trained sterilization and disinfecting services. We keep concrete and VCT flooring clean, as well as loading docks, storage space, and offices. Flexibility in scheduling allows your facility to function 24/7 and still enjoy clean conditions. Employees are more productive and happier when they have a safe, healthy, and pleasant work environment. Let us keep conference rooms, restrooms, and lobbies clean all day long. We exercise great care and train our associates fully to protect not only your workers and guests, but the ecosystem as well. Our teams are available 24/7 in order to clean your facility outside of business hours. For restroom maintenance throughout the work day, and for offices and industrial facilities that are operational on a constant basis, we offer day porter service. Let us keep your restrooms stocked with soap, paper products, and other consumables. SouthJan is skilled in cleaning LEED platinum certified buildings. We can design and implement approved green cleaning systems. Parking lot cleaning, operation room disinfecting, and many other services are available, all performed by associates who have been fully trained in all applicable topics, from security training to cross-contamination. Let us handle your building cleaning needs with professionalism and quality. We guarantee results and deliver the service you expect.